Hello Kitty is putting a new digital spin on the Advent Calendar with the Hello Kitty StoryGIF Advent Calendar by Zoobe Messenger Entertainment. This special countdown to Christmas runs from December 1st to 25th. Hello Kitty fans can unlock an adorable free GIF each day they come back. (Or purchase all 25 at once.) The app will be available in apps stores on November 30, 2016 - on iOS $.99 and Android $.79. The Advent Calendar is a Christmas tradition that has been around since the early 1900’s that acts as a special countdown the big day with 24-25 doors or windows with chocolate or other special little surprises when opened each day leading up to Christmas. 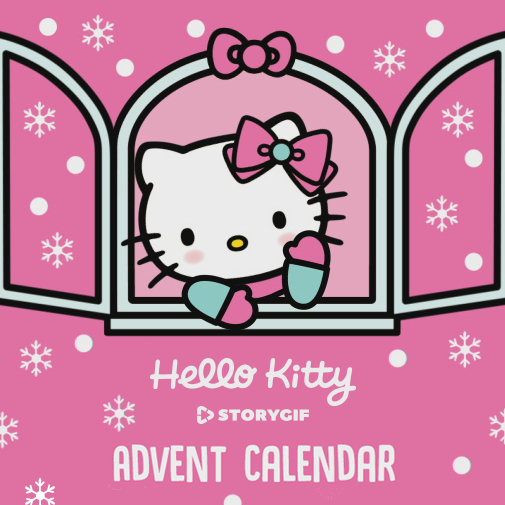 The Hello Kitty Advent Calendar is a digital experience that gives fans the same effect via their mobile phones with a new cute image to collect each day to express themselves, spread the holiday cheer and message to friends. Super cute. Super easy to use. The GIF app is pretty cool. I have it on my android phone. You can pick a few GIF's and put them together. Then you can send it to a friend. I tried one and sent it to my hubby via messenger. I think this could get pretty addicting. I'm a huge fan of Hello Kitty and anything Sanrio. Cute things are often called "Kawaii" in Japan. I showed my 4 year old this fun app and she thought it was great. She loves Hello Kitty too!